Are you interested in learning to play chess? Is your child? Teen chess champion and IMACS student, Rachel Gologorsky, shares her advice on how to get started. Read more about Rachel’s journey from curious toddler to 2011 US Girls Junior (U21) Chess Champion in her previous blog post. It’s really easy to be good at chess if you start the right way and with the right foundation. That’s how my father taught me after my mom explained the object of the game and how to move the pieces. He taught me to first focus on the last, i.e., the endgame. If you know where you want to go, the rest becomes easier—it is just a matter of execution. The endgame is the end stage of chess games, commonly defined as when there are fewer than six pieces on the board. There is so much to learn in endgames, but Jeremy Silman’s book, Silman’s Complete Endgame Course, is an excellent tool for learning all the endgame ideas one needs to know from beginner to master. Focusing first on the endgame is helpful because it highlights how the pieces coordinate together. When there are so few pieces it’s easy, especially for a beginner, to see how each of her moves affects the opponent’s move and how that, in turn, affects her next move. The first thing that beginners should learn in endgames is how to win, that is, how to put the opponent in checkmate. A checkmate, or “mate” for short, occurs when a king is under direct attack and cannot avoid being captured. Studying how to put the opponent’s king in mate helps a player to learn the relative power of different pieces and to sharpen her ability to create mating nets. Creating mating nets is the process of methodically restricting the options of the opponent’s king until, at last, the king is put in mate. These nets are especially pleasing to players with an innate sense of geometry, structure, and neatness. This is because mating nets are usually created by methodically repeating the same geometric structure in a precise move order, leaving nothing to chance in the quest to mate the opponent’s king. These methodical moves are actually plans, and the concept of plans and planning becomes an engraved tenet in the foundation of the young player’s mind. Later on the ideas of plans and planning become an important component of playing chess strategically. After I mastered the basic endgame checkmates (how to mate the opponent’s lone king with any of the following combinations: (1) king and queen, (2) king and two rooks, (3) king and rook, (4) king and two bishops, and (5) king, bishop, and knight), my father added another component to our program: tactics. The fork: A fork occurs when a single piece attacks two pieces at once. The skewer: A skewer occurs when one of your pieces attacks two of the opponent’s pieces in a line, where the more valuable piece is in front of the second piece. The opponent is forced to move the more valuable piece to avoid its capture, thereby exposing the piece behind it, which can then be captured. The discovered attack: This attack is revealed when one piece moves out of the way of another piece. The discovered attack can be very powerful, as the piece moved can make a threat independently of the piece it reveals. They succeed because the opponent is unable to meet the two threats at once. Learning and finding these elemental tactical patterns in positions is vital to a player’s development because doing so etches those patterns in the player’s mind. Once you own these patterns, you can recognize them in games. This allows you to turn lost games into winning ones and avoid turning winning games into lost ones. You can also build on these patterns and combine them to create potent combinations that, over a sequence of moves, force your opponent at the conclusion to lose something. The sequence of moves could force a checkmate, or force the opponent to lose material (valuable pieces or pawns), or force the opponent to give up a strategic asset. Making use of tactics to build up a combination in which I give up all of my pieces but one—the one that forces mate—is beautiful. Those combinations hold an aesthetic value for me, and that makes them fun to see and even more fun to play. My father always opened our tactics book last so that the end of our chess sessions was always the most fun. Today, however, free websites like Chess Tempo are becoming preferable to tactics books. Not only is there virtually no limit to how many tactical puzzles one can access, the tactical puzzles are chosen on a bell curve with consideration given to your rating. This way, the difficulty of the puzzles grows with your strength. After I grasped the basic tactical patterns, my father added a completely new dimension to our sessions: strategy. This too, in a way, is working backwards because implementing strategy allows one to coordinate one’s pieces favorably. And when that happens, tactical strikes usually appear that make use of the positions of the pieces. 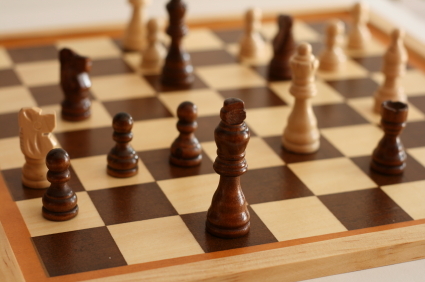 Strategy is the aspect of chess playing that is concerned with the evaluation of chess positions and the setting of goals and long-term plans for future play. Strategy is basically about playing better chess than your opponent and, in chess slang, is called “outplaying the opponent.” Jeremy Silman’s book, How to Reassess Your Chess, is a wonderful guide for learning a logical approach to strategy. • finding and implementing good and, if available, flexible and multi-purpose plans. Strategy, if implemented correctly, can also be beautiful. Unlike flashy tactics, however, strategy is deep and cannot be spotted easily. Finding strategic ideas and implementing them gives a player a sense of confidence, appreciation of the game, and satisfaction because a win based on strategy means that your opponent didn’t make any mistakes at all—you just outplayed them! Finally, my father turned his eye toward openings. An opening is how you start the game and usually lasts for around 10 moves or so. Openings are important in the sense that you want to start a chess game off on the right foot. One has to know openings in order not to lose the game right of the bat. Nowadays, some of the more advanced players don’t spend much time on openings because they already know the general principles. The most advanced players (grandmasters), however, have to know openings deeply because the slightest inaccuracy will be capitalized on by their opponents. If you’re just starting out in tournament chess, you will most likely play beginners. But even they are becoming more and more “booked up” (i.e., know many opening variations). Although I don’t recommend studying openings too much as a beginner, I do recommend studying the main opening you play enough to know its major guiding idea. That way you can parry any prepared move logically and stay out of trouble. There are those who will try to catch you in traps. Although better, logical play should and will eventually prevail, it’s useful to know common “trash trap” lines (i.e., a sequence of opening moves that sets a trap for you to fall into, but usually damages the position of the opponent who sets it). You will lose if you don’t see the “trash trap,” but if you know the trap, you will be able to counter it in such a way as to capitalize on your opponent’s damaged position. • creating and utilizing weaknesses. Openings also highlight elements that have both strategic and tactical components, such as the importance of tempi (the interplay of time and moves), plans, and counterplans. These things are usually explained very well in most opening books. Chess Openings for White, Explained and its companion volume, Chess Openings For Black, Explained do an exceptionally good job of explaining opening ideas. If one is serious about chess one should also play in rated USCF (United States Chess Federation) tournaments, if only to test the ideas out in action and to track progress. Since it’s often impractical to go to tournaments more often than once a month (unless there is a chess club nearby), I recommend either playing games in the meantime on the free ChessCube website, or buying a membership to the Internet Chess Club (ICC, $30 per year). In my experience, ICC has better interfaces, graphics, and is generally easier to navigate and understand than other chess servers. But the main point is that one has to play games often in order to track progress and improve. As the player’s skills improve and s/he reaches a class D (1200-1400) tournament rating, hiring a private coach can be of an enormous help. My current coach, GM Alexander Shabalov, a four-time US chess champion, has been instrumental in analyzing my games, explaining new opening ideas to me, and pinpointing my weaknesses and misconceptions. Finally, although Zermelo’s theorem in game theory proves that chess can be “solved” in the sense that the game’s final outcome can be forced, chess is still a game of so many possibilities that understanding its intricacies is a lifelong endeavor. I know that throughout my lifetime, my attempt to understand chess better will be a journey of constant learning. And, that is my goal: to learn all I can, in chess and in the world in general. Editor’s Note: The IMACS Blog will return on Thursday, July 19th. If you’re celebrating during 4th of July weekend, have a happy and safe time! Make IMACS a part of your strategy for academic success! Check out our online courses in gifted math and computer science Register for our free aptitude test. Play along with our weekly IMACS logic puzzles on Facebook. Can it really be that almost a year has passed since our very first ‘Staff Picks’ blog post? That means another class of IMACS graduates is moving on to new adventures in learning, and we are busily planning for our Hi-Tech Summer Camp. It also means that it’s time to meet three more members of our IMACS family—Daniel Payne, Ken Matheis, and Lauren Rosenfarb—and to get their book and movie recommendations for this summer. Dan has been teaching for IMACS since 2003. 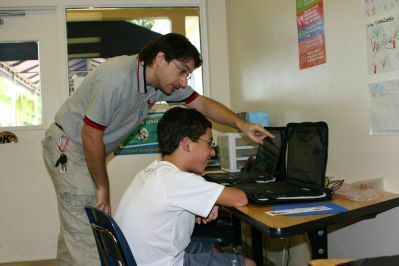 He teaches all levels of math and computer enrichment and our University Computer Science I course. 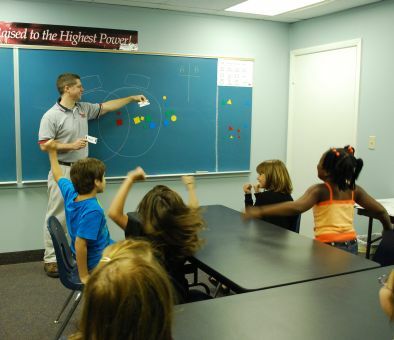 In addition he teaches many of our Placement Classes for new students. Dan is very enthusiastic in everything he does and it shows as his students love his classes and always hope that he’ll be teaching them again the following year. Dan received his BA degree in Anthropology from Florida Atlantic University and also has an extensive IT background. “My favorite book is The Hacker Crackdown by Bruce Sterling. It’s a true crime story about the the dawn of computer hacking as a romanticized pursuit for teenagers. These were my contemporaries, and as a part-time denizen of the electronic BBS culture, I felt connected to the stories in this book. Sterling dissects the lives of the ‘villains’ to walk the reader through what lead the kids to commit these crimes and how the FBI was in way over their heads trying to catch them. There is something special about the electronic ‘nerd’ culture heroes who were only known by a select few until the movie The Matrix formalized this appeal to the masses in 1999. That leads me to my favorite math/science movie. Yes, The Matrix. Pop culture latched on to the visuals, but for me that is only a bonus. It was the right movie at the right time, bridging the shift in the meaning of ‘nerds’ from a pejorative for socially awkward brainiacs to exceptional, savvy people who know how to do important things the rest of us do not. The protagonist, Neo, a hacker superhero, could not have existed on screen ten or even five years prior. The few movies that tried it were unable to capture the hacker/gamer culture that had already existed on a small scale for decades. Yet he seems perfectly believable ever since. Ken is a senior instructor for our computer science program. Ken was a student in Project MEGSSS, the predecessor program to IMACS, through 11th grade. When MEGSSS lost its public funding for his senior year, he completed his courses at IMACS as one of our first group of students! Ken received bachelor’s degrees in Mathematics and in Electrical and Computer Engineering from Rice University. He was a part-time IMACS instructor from 2000 through August 2011. During part of this time, Ken completed his MS and PhD in Mathematics with a specialization in Cryptography. Since September 2011 Ken has been working full-time with us as an instructor and also as a programmer working on several important projects, including our ISLANDscience virtual science lab. “For my favorite TV series, I have to go with Star Trek. No matter which spinoff series you watch, you see Gene Roddenberry’s vision of what humanity could accomplish if we got over our minor differences and worked collectively to solve the more serious problems we face, such as widespread hunger, severe poverty, and abject racism. Equally important, the characters also demonstrate the right attitudes one should have when resolving conflicts: cooperation over stubbornness, empathy and diplomacy over aggression, understanding over ignorance. Sure, there are plenty of physical conflicts as well, but entering into them is depicted as a last resort. 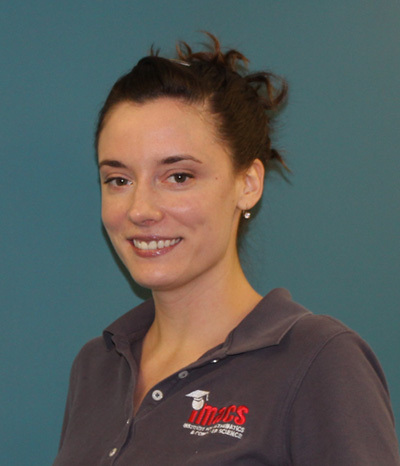 Lauren began her IMACS career in 2005 as an instructor. She is now our Marketing Director and also manages our homeschool programs. Lauren graduated from the University of North Carolina at Chapel Hill with a degree in Public Relations and Journalism and Mass Communication. We love having such multi-talented people on our staff! “I really enjoyed many of the math and science focused books and movies previously mentioned in our ‘Staff Picks’ segment. Two additional math and science movies definitely worth watching are Moneyball and Contact. Moneyball, originally a book by Michael Lewis, is based on the true story of Oakland Athletics baseball general manager Bill Beane (portrayed in the movie by Brad Pitt). After loosing many of his star players, Beane has to reassemble a ball club despite an almost impossibly tight budget. Beane hires Jonah Hill’s character, Peter Brand, a young, Ivy League economics grad, with radical ideas about building a winning team. Using statistical analysis, Brand and Beane find a whole team of undervalued players and invest, not in stars, but rather in probable hits and runs – the stuff that wins are made of. The idea of valuing statistical data and probabilities over intuition and experience does not sit well with Beane’s scouts and controversy ensues. Dan, Ken, and Lauren – thank you for sharing these books and movies. Our blog readers will surely enjoy these thoughtful suggestions. Looking for more summer activities to keep your mind sharp? Check out the online courses in gifted math and computer science from IMACS! Register for our free aptitude test. Play along with our weekly IMACS logic puzzles on Facebook.